A multi-tasking tool is a handy thing to have on hand. Just ask any owner of a Swiss Army Knife. We have something similar here at Doosan. It doesn’t come with tweezers or a toothpick, but if you want to turn out more completed parts on a single machine with less operator time, our PUMA SMX ST series does the job. We call them super multi-tasking turning centers for a reason. What do they look like? Well, imagine combining a VMC and an HTC into one unit and you’ll get an idea. There are axes everywhere: X, Y, Z, X2, Z2, A, B, C1 and C2. Both left and right spindles are capable of high accuracy C-axis control and the machine can perform various machining functions like turning, milling and synchronized cutting…all with a single set-up. Start with PUMA SMX productivity plus. The ST models come with all the advantages and features of the SMX series, and that’s saying a lot. For starters, they have high-rigidity machine construction, minimized thermal deformation via oil coolers, an accuracy control feature based on multiple thermal compensation functions and a Y-axis machining area that has been maximized through orthogonal design. 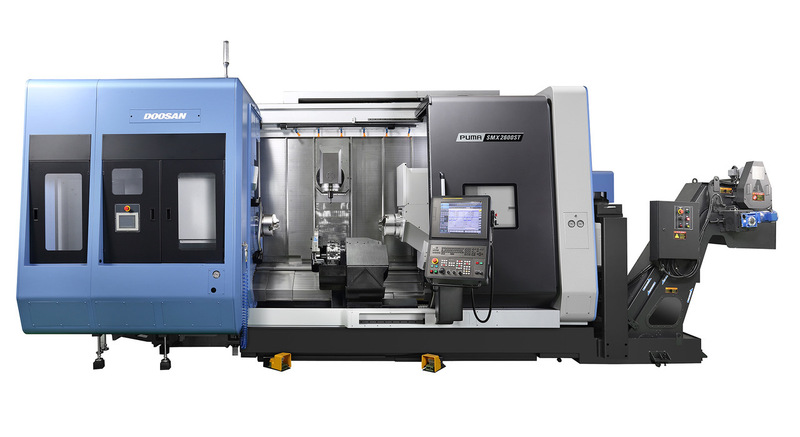 Along with the largest machining space among the same-class machines, they come standard with Doosan’s famous ergonomic features that enhance operator convenience and efficient maintenance. As good as the SMX machines are, the ST versions get even better with the addition of a lower turret turning/milling function to the existing left and right spindles and B-axis milling function. The turret comes on both of our new SMX ST models: the 10” chuck version (PUMA SMX2600ST) and 12” chuck version (PUMA SMX3100ST). Let’s break down what this turret can do for you. The addition of a lower turret with 12 tool stations allows operators to be even more productive on a single mill turn CNC machine. A static turret is standard, and turret for driven tools is optional, but this lower turret isn’t just for tools. You can drop in workholding equipment like steady rests, follow rests, tail stock center and two jaw vises as well. Do you have complex aerospace components? It doesn’t matter. Automobile transmission parts? It doesn’t matter. Are you trying to get more production parts out the door instead of turning down business? It doesn’t…Okay, that matters! It’s a plain fact, folks. Companies that don’t take advantage of the capabilities of the SMX ST series will have a tough time keeping up with the competition. Talented operators are punching out for the last time every day, with no replacements in sight. With our PUMA SMX2600ST/SMX3100ST, you can migrate more production to a single CNC machine capable of completing parts with minimal worker involvement. The SMX ST series comes with so many features that it might be hard to wrap your head around it. Let’s step back and look at the big picture. We started with a full 5-axis multi tasking turning and milling machine with a 12,000 RPM milling spindle and 80 tool ATC. Then we added a lower 12 station turret that can offer turning or milling capability while still utilizing the upper milling head to truly multi task. What does all that mean? Basically, you get limitless productivity with the purchase of just one machine! This really gives you only two options. You can buy three different 3-axis machines, move product from station to station and have unfinished pieces sitting on a pallet waiting to be completed. Or you can use a PUMA SMX2600ST/SMX3100ST that does the same thing for about the same price and ship those pieces out the door TODAY! Easy choice. Call your local doosan distributor, visit http://www.doosanmachinetools.com or call us direct at 973-618-2500. You’ll be glad you did.